Albrecht Schmidt is a professor for User Centered Ubiquitous Media in Computer Science. He studied computer science in Ulm and Manchester and in 2003 received a PhD from Lancaster University, UK. His work focuses on novel user interfaces to enhance and amplify human cognition. He co-founded the ACM conference on Tangible and Embedded Interaction (TEI). In 2016 he received an ERC Consolidator Grant for the Project “AMPLIFY: Amplifying Human Perception Through Interactive Digital Technologies”. “Historically, use and development of tools is strongly linked to human evolution and intelligence. Over 10.000 years, physical tools transformed what people can do and how they live. The design of tools and environments impacts what we (can) do. 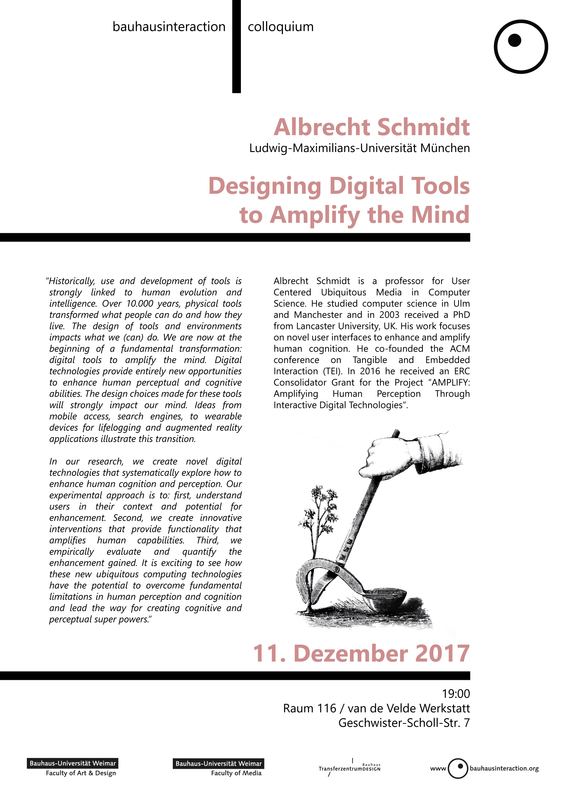 We are now at the beginning of a fundamental transformation: digital tools to amplify the mind. Digital technologies provide entirely new opportunities to enhance human perceptual and cognitive abilities. The design choices made for these tools will strongly impact our mind. Ideas from mobile access, search engines, to wearable devices for lifelogging and augmented reality applications illustrate this transition.